Life was dull for the old bamboo cutter and his wife. They were poor, lonely, the old man was overworked, and their life was very dull. Dull that is, until one day when the bamboo cutter noticed that one bamboo stalk was glowing. The old man, bending over for a better look, saw that a 3-inch tall girl was inside the stalk of bamboo! The old man and his wife had never had any kids, so of course they were pleased. They named the girl Nayotake no Kaguya-hime, the Shining Princess of the Young Bamboo. As the child grew into a young woman (this taking only 3 months), it became clear that she was one of the most beautiful women in the world, so beautiful that she seemed otherworldly. After a while, the old bamboo cutter decided that it was time for Kaguya-hime to marry. Word of her beauty had spread quickly, and year after year men came to her home if only to catch a glimpse of her. Finally, after many years, all except for 5 of the most determined men had left. These men were Prince Ishizukuri, Prince Kuramochi, the Minister of the Right Abe no Mimuraji, the Grand Counselor Otomo no Miyuki, and the Middle Counselor Isonokami no Marotari. These 5 men each were given a task to prove their devotion to Kaguya-hime. Prince Ishizukuri was sent to find the begging-bowl of the Buddha, Prince Kuramochi was sent to find a jeweled branch of Paradise, the Minister of the Right Abe no Mimuraji needed the robe of Chinese fire-rat fur, the Grand Counselor Otomo no Miyuki was to get a 5-colored jewel from a dragon's head, and the Middle Counselor Isonokami no Marotari was asked to retrieve the easy-birth charm of the swallows. You can probably guess that Kaguya-hime did not want to marry, as the items that she sent the men out to get do not exist. The next 5 chapters describe the journeys of the 5 men; all of the journeys were rough, and most lasted several years. In the end, Kaguya-hime marries none of the men, as a surprising truth about her real identity is revealed. 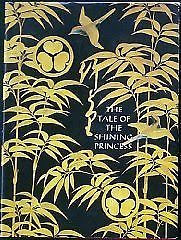 The Tale of the Shining Princess is an old Japanese legend of this otherworldly woman who comes down to Earth. In this story, there are several poems written by Kaguya-hime and the 5 men mixed in with the storytelling, as well as several beautiful paintings describing the story. The original album of the paintings in the story is in The Metropolitan Museum of Art. The original author is unknown, and this version is based off of a translation. While The Tale of the Shining Princess is not a long story, young people and anyone who has trouble reading foreign languages may stumble over some of the names. But other than that, this legend is great for lovers of mythology (like me)! Daddy's afterthoughts: I first found this volume on a shelf of cast away books at a take-a-book-leave-a-book station at a local college. What a treasure. The color plates alone make the book worth owning, Edo-era Japan illustrations of scenes from this thousand-year-old tale, thought to be one of Japan's oldest legends. This version, published by the Met, contains a text by Sally Fisher, an adaptation of a translation from the Japanese by Donald Keane. The story itself, believed to date back to the 10th century (circa 909, according to Haruo Shirane's Traditional Japanese Literature: An Anthology), but even that telling was itself an embellished iteration of an earlier oral folk narrative, its origins likely lost to antiquity. Curiously, its original (10th century) title was 竹取物語, Taketori Monogatari, or "The Tale of the Bamboo Cutter," the emphasis on the male bamboo cutter, and it is perhaps worthy of note that later iterations of the tale bore titles such as "The Tale of Kaguyahime" or this, "the Tale of the Shining Princess," with the focus (more appropriately, perhaps) on Kaguya-hime herself. On a broader note, I love mythology, and recommend its reading for all age levels, but especially children. No other form of storytelling conveys as much wonder, as much of a sense of what C. S. Lewis called "the numinous" as myth. This particular volume clocks in a 70 paginated pages, making it somewhat longer than your normal short-story-length myth, but much shorter than a novel. Its simplicity makes it a great read for children, but its style and the beauty of the language held me rapt when I first read it as a man of 40 or so years. It's a tough book to find, but thanks to the internet, this volume may be had (secondhand) from a variety of sources.